OPENING April. 27th - 2nd Round FREE! *Start game one hour prior to closing. * We reserve the right to close during inclement weather. if you get rained out, receive a free pass! 3 & under FREE with paid adult. Madison's Chocolate Shoppe Ice Cream makes their ALL-NATURAL mix with rbGH-free cream from Wisconsin cows, pure cane sugar, and natural stabilizers. Less air and a minimum 14% butterfat gives you more licks per scoop and a creaminess you won't find anywhere else. We are currently out of ice cream for the sgearing up for the '19 season and will post flavors soon! A full ingredient list and dietary information is available at www.chocolateshoppeicecream.com. ...inspired by the great ancient Mayan civilization – is an 18-hole miniature golf course located in the harbor town of Oconto, Wisconsin. Rolling greens with interesting elevation changes and numerous trick shots will keep even the experienced golfer engaged. Water surrounds you from the palapa-covered waterfall to two ponds and a stream and tropical landscape with thatch accents. 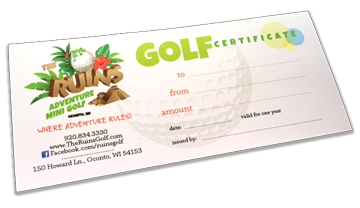 Designed and constructed by the leading Miniature Golf Company in the world – Harris Miniature Golf – The Ruins offers an interesting and quality course for all ages. With the outer 9-hole loop meeting ADA requirements - we are proud to offer a course that everyone can enjoy! Experience the adventure! With all overhead lights turn off, the course is lit with blinking and color-changing LEDs, rope light along the stream and other glow gear. Holes and balls are lit up. Enjoy a unique atmosphere with music and fun people! Let The Ruins host your event! With two outdoor decks with plenty of seating, ice cream, snacks and beverages – including craft beers and wine – we provide a fun and relaxing atmosphere amidst the sounds of running water and a beautiful landscape with a view of the Oconto River! Convenient and perfect for all ages! Any amount you want - simply stop in and get one today! Come just for the ice cream! Madison's award-winning Chocolate Shoppe Ice Cream! Superman, Blue Moon and other award-winning flavors! Food is not allowed on course, but we have two comfortable decks with seating for relaxing in between rounds. Beer, wine, hard sodas (we ID!). Help us spread the word! Your reviews, likes & shares help us reach beyond our local community!